The highest assessed 4 year old stallion in the world, Conformation 8.48, Ri Son of Ómur frá Kvistum (8.61) and Kantata frá Hofi (8.26). Konsert frá Hofi (8.72) is the highest assessed four year old stallion in the world, he is also the only four year old stallion that has got 10 for tölt. Konsert is the son of Ómur frá Kvistum (8.61) and Kantata frá Hofi (8.26). Sinfónía frá Heimahaga is the daughter of Konsert frá Hofi (8.72) frá and Sólný frá Hemlu II (7.97). Sinfonía was born on the ???. 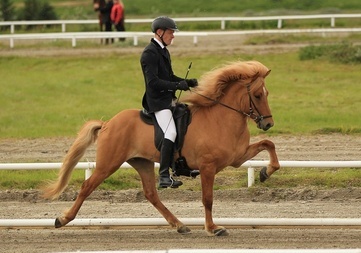 Sólný frá Hemlu II is an powerful five gaited mare with 7.97 in total and tölt as her main gait. She has received 8.0 for Conformation and 8.0 for Rading Abilities in two different breeding shows. 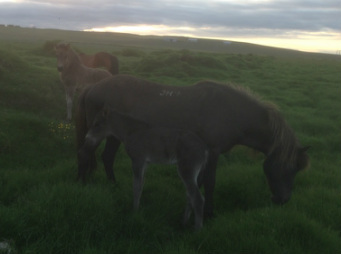 Sólný is a daughter of Elvis frá Fíflholti (8.31), brother of Hnokki frá Fellskoti, and Sveifla frá Úlfsstöðum.